Last week some Instructor Specialty training was completed. Independently from each other, Ton, who completed his IDC and IE last year in May (my first blog entry!) and Stuart who completed his IDC and IE last year in October with me, each came to me for Instructor Specialty training. Over a few days we completed amongst others Underwater Navigation, Boat, Deep, Aware Fish ID and the Multilevel Instructor Specialties. We had some very nice dives and I saw a few 'firsts' for myself, 2 Jenkins Whiprays on Chaweng Beach and at Twins (Koh Tao) a Yellowmargin Triggerfish. During this dive I also saw an octopus during the safety stop, although they're quite common, I don't see them a lot. Very unfortunate and therefor very nice to see this one for a few moments, drastically changing colours all the time. 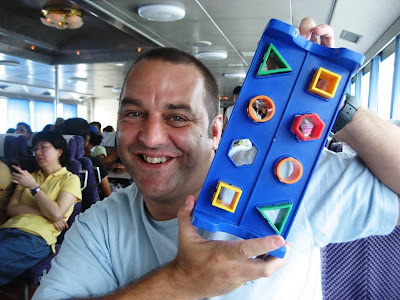 Here's Stuart, happy that he sorted his deep dive timed task. 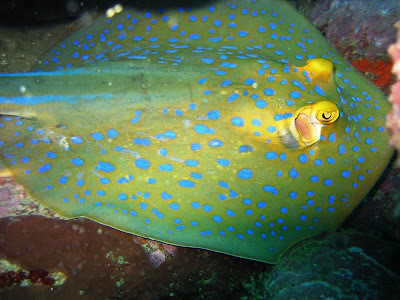 At Red Rock/Shark Point at Koh Tao, we spotted this lovely bluespotted stingray. At White Rock, also at Koh Tao, this white eyed moray eel was was lazing around. 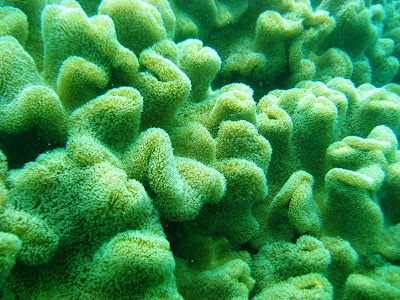 A reef impression around Koh Tao with small reef fish and Christmas Tree worms or Spirobranchus giganteus. We had a couple of good days diving and during last week, there were also several sightings of whale sharks around Koh Tao, but we missed each day that we were out on the boats.